Level Up Village is Headed to Global Ed Forum Oct 14. in Philly! Level Up Village is proud to participate in the Global Ed Forum on Friday, Oct. 14 in Philadelphia! See how we’re connecting students from around the world for meaningful, global STEAM collaborations. We’ll be giving demos of our global communications platform throughout the day and will feature a live global exchange from 12:30-2:30p. Level Up Village (LUV) looks forward to participating in the Global Ed Forum on Friday, Oct. 14th in Philadelphia! This event, sponsored by the Asia Society, will bring together more than 400 innovators, leaders and influencers in K-12 Global Education and Higher Ed. The Global Ed Forum will feature a variety of interactive workshops, rousing talks and offer plenty of time to mix & mingle with like-minded educators and influencers in global education. We’ll showcase our recently relaunched, mobile-friendly Global Communications Platform throughout the day on Friday and demonstrate a live global exchange with our partners in Pakistan and Nicaragua from 12:30-2:30p. We are also pleased to be sponsoring the Shared Studios portal along with VIF, The Qatar Foundation and P21, which all share our commitment to promoting global competency. Find us at Level Up Village booth on Friday from 12:30-2:30 and outside the Shared Studios tent the rest of Friday afternoon. Stop by to learn more about our pioneering global STEAM courses and how we facilitate meaningful global collaboration between students from around the world. Educators will also have a chance to sign up to be among the first to offer our new Global Perspectives: Fractured Lands (WWI- ISIS) course and other new offerings, set to launch in 2017. Come see a live Level Up Village global exchange with iEARN Pakistan from 1:30-2:30 at Global Ed Forum. Read more about the 21st Century learning taking place in Level Up Village courses in Pakistan here. Several Level Up Village team members will be on-site, including CEO & Co-Founder Amy McCooe, Co-Founder & Global Strategy Advisor Neesha Rahim and Curriculum Director Erin Dowd. From 1:30-2:30, conference attendees will have a chance to experience a live global exchange with NicaPhoto, LUV’s global partner in Nicaragua. 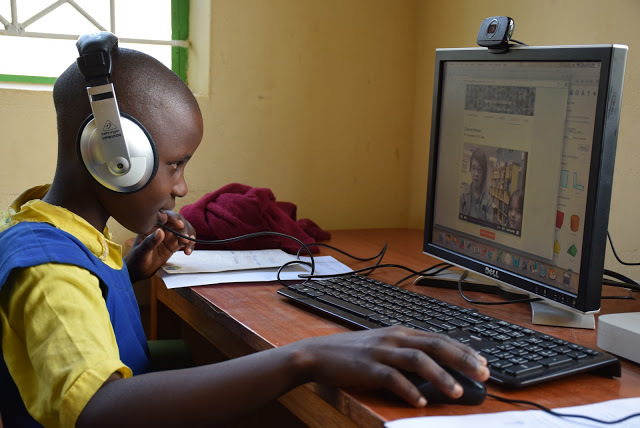 A student at Kenya Connect watches a video message from her global partner student in the U.S. in Level Up Village’s Global Inventors course. (Read more about our partnership with Kenya Connect here.) Stop by to see us at the Global Ed Forum to learn more about our pioneering global STEAM courses and some new and exciting offerings set to launch in 2017!